From walking to kayaking, or simply relaxing on one of Anglesey’s many beaches, you won’t find yourself short of fun and enjoyable things to do during your stay at Anglesey Yurts. Anglesey has a lot to offer from a rich archeological and historical heritage to a variety of outdoor pursuits both land and water-based! Key attractions are the many beaches – unspoilt and hidden coves to the busier family beaches. Watersports are a key factor in many holidays taken on the island, sailing, windsurfing, kite-surfing, kayaking the list is endless! Sea or coarse fishing – all catered for. The photo here shows the Church of St. Rhuddlad that Church Bay is named after. Consecrated in 570 A.D. the present church was built in 1858 with a magnificent spire used as a navigation point for sailors being visible miles out at sea. 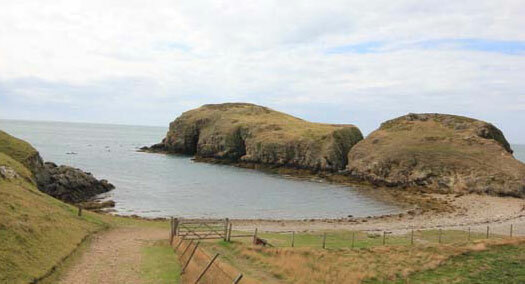 The locals refer to the cove as Porth Swtan literally translated as ” Bay of Whiting”. There are a plethora of other wonderful beaches and coves all within a very short distance of Anglesey Yurts, but we are particularly proud of this one as from childhood we have spent many hours in, on or under the sea here! Also nearby, the Wavecrest Cafe has a great selection of hot and cold food, with teas, cold drinks and ice creams. Essential tools for rock pooling and sand castle construction are also available. Fine dining at the renowned Lobster Pot restaurant is a must as part of your holiday – booking is essential! 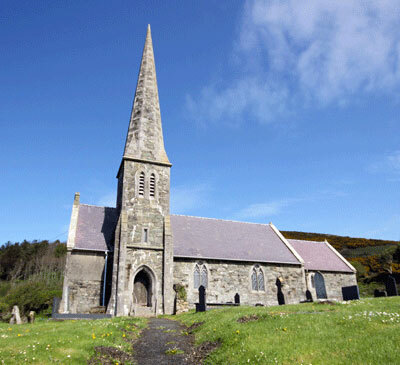 For keen walkers the Isle of Anglesey Coastal Path official starting point is at St Cybi’s Church, Holyhead – running for 125 miles it can be completed in 12 days allegedly, however it is possible to use public transport to and from more manageable sections! More information can be found at the Friends of The Isle of Anglesey Coastal Path. There are numerous local paths to explore and we have OS maps available for guests to borrow. Cycling is extremely popular on on the island and cyclists of all abilities and ages are welcomed on Anglesey – we have two of the nine National Cycle Routes here! More information can be found here. Watersports – the list is endless – jet-skiing, rib riding, sailing, diving …you can really do it all here. Please let us know if you have dinghies or other small watercraft that you would like to bring. We have adequate parking available. Closest 24 hour convenience store (with cashpoint) located in Valley (7 miles south). Very good butchers in Valley too. Larger supermarkets including a 24hr Tesco, Morrisons, Aldi & Iceland located the outskirts of Holyhead (12 miles) – go back towards Valley and turn right at the traffic lights, continue towards Holyhead with Tesco with Morrisons just across the road. Cashpoint and fuel available at both locations. The Church Bay Hotel is the nearest pub (walking distance) OK for drinks – no food served. Church Bay, the nearest (dog friendly) beach is just 5 minutes by car (free car parking) or a 20-30 min. walk through the fields. Other beaches can be found by following the coast road in either direction. The nearest minor casualty unit is in Holyhead – pass Tesco and turn right. Pharmacy – one in Valley, another in Cemaes Bay, also Tesco has in-store pharmacy.